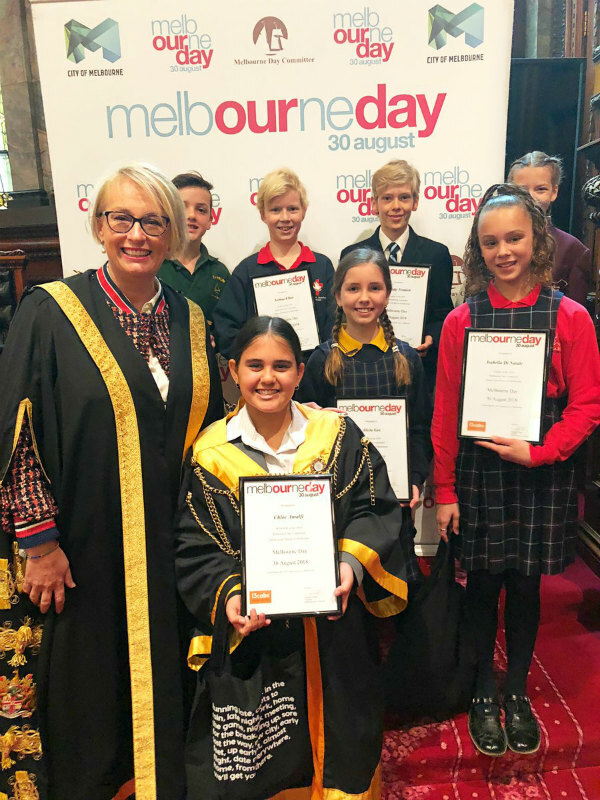 Lords of cool (L to R): Alicia Gec, 10, Taylors Lakes Primary School, Taylors Lakes; Ned Capp, 12, Carrum Primary School, Carrum; Chloe Shovelar, 12, Mentone Girls' Secondary College, Mentone; Freddie Tremlett, 12, Christ Church Grammar School, South Yarra; Chloe Amalfi, 12, Genazzano FCJ College, Kew (2018 Junior Lord Mayor); Joshua Elliott, 11, St Louis de Montfort's School, Aspendale; Isabella Di Natale, 10, Stella Maris Primary, Point Cook. 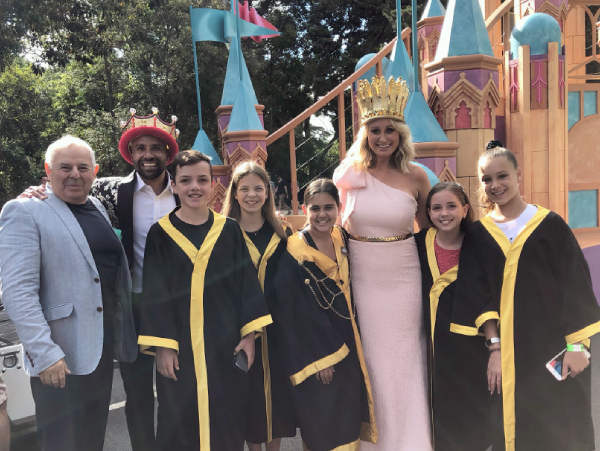 City royals at the 2019 Moomba Parade (L to R): Melbourne Day committee member and Australia Day Ambassador Claude Lombard; Moomba King and Melbourne Victory star Archie Thompson; Junior Mayor winners Ned Capp, Chloe Shovelar and Junior Lord Mayor Chloe Amalfi (wearing mayor chains); Moomba Queen, meteorologist and Channel Seven weather presenter Jane Bunn; Alicia Gec and Isabella Di Natale. Hot shots: 2018 Junior Lord Mayor Chloe Amalfi and Lord Mayor Sally Capp as Herald Sun's Jason Edwards works to get the perfect shot. Watch out Vienna, Melbourne's new Junior Lord Mayor wants our number one title back. And Chloe Amalfi, 12, from Genazzano FCJ College in Kew, has a list of homework for Melbourne to win back its crown. 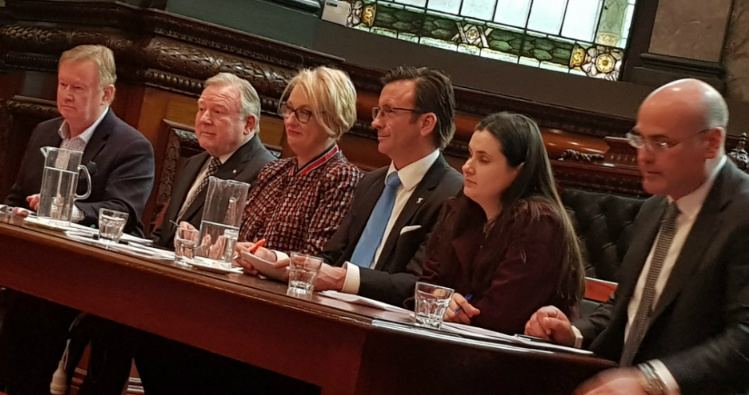 "We should be the World's Most Liveable City," she told our judges, who declared her the overall winner from seven finalists — one extra than the announced six because of strong and impressive competition entries. 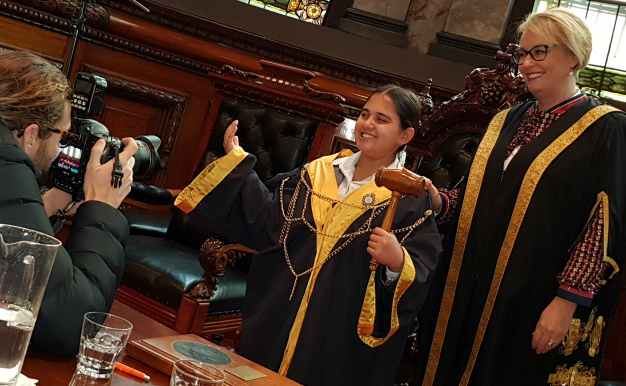 She was "sworn in" at Melbourne Town Hall on 20 August, and holds the title for a year — wearing the mayoral robes and chains, performing official and fun duties, marching with classmates in the Moomba Parade and hanging with Lord Mayor Sally Capp. Her big-ticket policy is helping Melbourne's homeless, suggesting more empty buildings should be turned into shelters. "Forty thousand people are on a waiting list for crisis housing," Her Worship said. Chloe also advocated a cleaner city and managing the city's population growth, including better infrastructure, especially more efficient transport. "I want to make everyone very happy in Melbourne," she said. She is an advocate of city safety, and wants expanded the program of festivals and events to woo more tourists. The Essendon AFL supporter said Melbourne was a "very good fun city with a lot to see and do". We had good schools and sports facilities, and lots of opportunities overall, she said. She said she would work with Cr Capp "to make Melbourne a better city than it already is". She was supported at the judging ceremony by dad Charlie, mum Alexandra and brother Ethan. After a series of media interviews, one of her first official duties is helping raise the city's flag on Melbourne Day at Enterprize Park on 30 August. The judges had a tough choice, Cr Capp said. The finalists had compelling campaigns, running on issues including cutting food waste, reducing plastic use and packaging, a healthier and more fit community, recycling programs and graffiti minimisation. Cr Capp thanked Sienna Koop, the 2017 Junior Lord Mayor. She said the position of Junior Lord Mayor was "a wonderful city ambassador". Now in its sixth year thanks to partner 13cabs, the competition is free and tailored to educate students about Melbourne, instill civic pride, to show how we got here and the journey since being founded in 1835. Melbourne Day Committee thanks everyone involved: those who entered, teachers, parents, the judges, City of Melbourne staff, Cr Capp, corporate partners and supporters. And the winner is: The moment Lord Mayor Sally Capp declares Chloe Amalfi from Genazzano FCJ College, Kew, the Junior Lord Mayor of Melbourne for 2018-2019 — with an impromptu drumroll! Drats! Missed out? No problem. Class of 2018: Judges, finalists and Melbourne Day deputy chair Sue Stanley, bottom right. 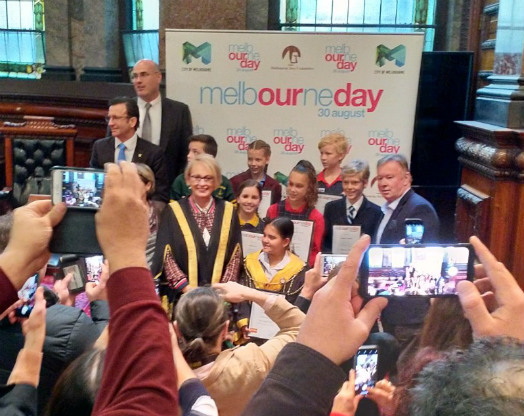 All together say "Happy Melbourne Day": A group photo in the historic Melbourne Town Hall council chamber. 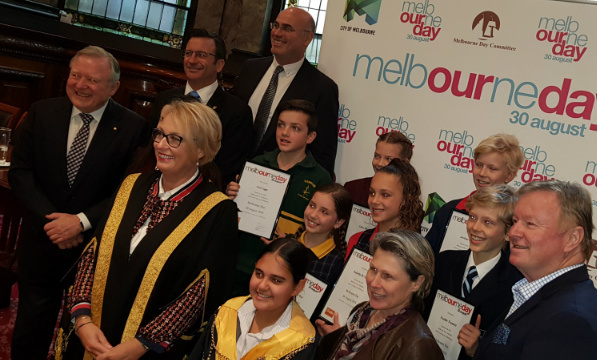 All-round winners: Lord Mayor Sally Capp; (L to R, rear) Ned Capp, 12, Carrum Primary School, Carrum; Joshua Elliott, 11, St Louis de Montfort's School, Aspendale; Freddie Tremlett, 12, Christ Church Grammar School, South Yarra; Chloe Shovelar, 12, Mentone Girls' Secondary College, Mentone; (front) Junior Lord Mayor Chloe Amalfi, 12, Genazzano FCJ College, Kew; Alicia Gec, 10, Taylors Lakes Primary School, Taylors Lakes; Isabella Di Natale, 10, Stella Maris Primary, Point Cook. It can be overwhelming entering the Junior Lord Mayor competition. So, thanks to the journaling app ANECDOTE, our lords of cool get to record and have a keepsake of their experience. The online tool is an easy and fast way to capture reflections, thoughts and feelings of their judging ceremony adventure at Melbourne Town Hall, getting VIP treatment at Melbourne Day birthday celebrations on 30 August, doing media calls, staring in the Moomba Parade and performing other fun activities over the year. Powerful yet fun and easy-to-use, the tool promotes good writing habits, clarity of thought and getting organised — just what every teacher wishes of students. And it sends helpful reminders for when life gets too busy, busy, busy. Help us raise the flag — and we'll bus in your class, free! We're calling on schools to attend the official flag-raising ceremony on Melbourne Day, 30 August, at Enterprize Park. You organise a class excursion, and we'll organise your transport — on us, with lunch! It's a fantastic way to get students of all ages learning about Melbourne and our city's history. And meet Melbourne's "first settlers", including Gilbert, the Tassie tabby, our city's first cat. Teachers, contact Melbourne Day executive officer Kathryn Izzard via this form or phone 0418 694 701. Flag Day: Junior Lord Mayor 2016 Mason Dwyer and classmates from St Louis de Montfort's Primary, Aspendale; Victoria Police Pipe Band; Lord Mayor Robert Doyle, Mason and Melbourne Day Chairman Campbell Walker; Enterprize re-enactment crew. The resources and ideas below can be used in classrooms, child care centres, kindergartens — and by parents at home. See also the other celebrations on the Events page. Free and fun activities are available as downloads on the Join in page. Primary school students will love learning about their city through the eyes of Gilbert, Melbourne's first cat — the Tassie tabby who arrived on the Enterprize with the first settlers. Gilbert and the Guardians of Melbourne tells the story of Melbourne, including Aboriginal history, via a series of city "guardians", or historical landmarks, representing culture, industry, events and other elements that have shaped Melbourne. Gilbert takes you on a captivating journey, explaining in a fun and engaging way the story of how Melbourne started. It is suitable for use by students in Years 3 to 6, and features a variety of activities to get students thinking and embracing history. It comes with a separate Education Kit support guide (see below) for teachers, if needed, to get in classrooms the most out of the e-book. Developed by Dr Jo Clyne at History Teachers' Association of Victoria Opens in new window and Melbourne Day Committee, the colourful e-book is ideal as a teaching aide in classrooms and an activity for parents to use at home — to bring to life the Melbourne story, and capture students' imaginations about history. 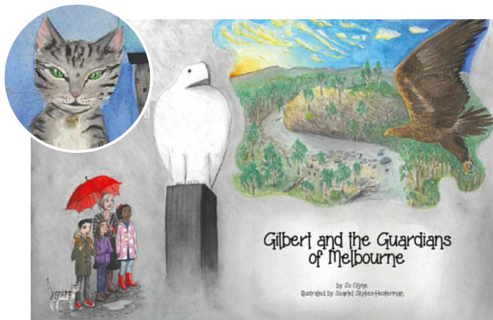 Or read Gilbert and the Guardians of Melbourne in your browser as a flipbook. Author and historian Dr Jo Clyne explains why the resource has impact in classrooms. "The book encourages students to think about historical perspectives and how much Melbourne has changed over time," Dr Clyne tells Agora, the HTAV's quarterly magazine. Our experts are visiting schools to talk about the city's founding, the Junior Lord Mayor Competition, how students can get involved, and more! Get all your students' questions answered. Incursions are free thanks to Melbourne Day Committee's schools education program, and are tailored for different age groups. Contact us to book a speaker free. Learn what life was like in colonial Melbourne, from people who were there. Discover Melbourne's criminal past, the history of Victoria's changing landscape, political events, gold rushes and the impact of the World Wars. All this and more is available at the state library's terrific Ergo website, designed with special sections for students and teachers. The library's The Changing face of Victoria free and permanent exhibition brings together more than 220 fascinating historical artefacts, photographs, drawings, maps, letters and diaries to tell the stories of the people, places and events that have shaped life in Victoria. Free guided tours are available for schools. Items on regular display include key artifacts such as the Batman Deeds, the last notes of Burke and Wills and Ned Kelly's armour. Discover also the colourful story of jam making in 19th-century Marvellous Melbourne, see early photographs of the Princess Theatre, and learn about the often-forgotten role of women on the goldfields. Located in the library's Dome Galleries Level 5, the exhibition is open Friday to Wednesday 10am to 6pm, and Thursday 10am to 9pm, except for public holidays. 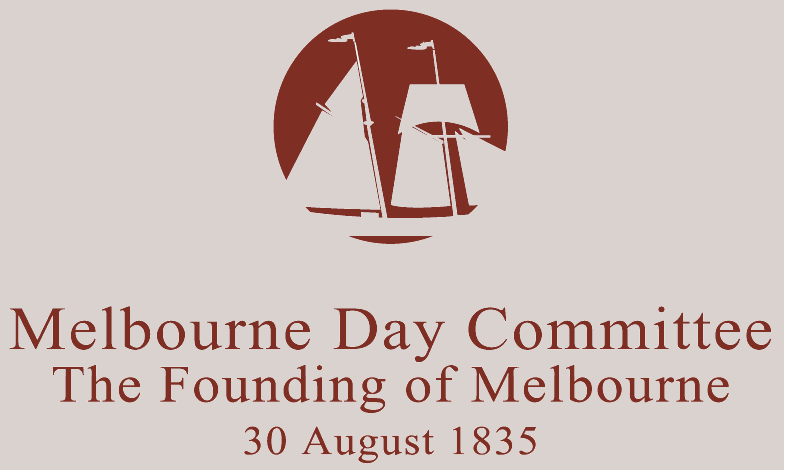 The establishment of the city of Melbourne. Free tours of Melbourne's historic Town Hall are available weekdays and give visitors the chance to learn about the architectural, social and political significance of this impressive 19th century building. Experience the grandeur of the wood-panelled Council Chamber, stand on the portico where the Beatles waved, sit in the Lord Mayor's chair and view the richly-carved Melbourne Town Hall Grand Organ, the largest grand romantic organ in the southern hemisphere. Education with altitude! Eureka Skydeck 88 offers school trips to the highest classroom in the southern hemisphere. The landmark offers a host of educational activities and fascinating facts from the interactive displays on offer. An education co-ordinator can help plan the specific learning needs of your students. Hear spoooooky ghost stories about the gardens' past as a cemetery, its crucial yet forgotten role in shaping Melbourne as a signalling station and more on this guided tour by Royal Historical Society of Victoria experts. If you dare! Learn also Flagstaff Hill's place in Melbourne’s topography, pre-European history and its fascinating role as a magnetic and meteorological observatory. It's an absolute "must do" for understanding the history and character of Melbourne. Special, discounted tours during Melbourne Day week are available. Discover the city many locals miss with the award-winning Hidden Secrets Tours. Re-live Melbourne's maritime history aboard the much-loved Enterprize. Sail Victoria Harbour and learn about the ship's role in Melbourne's founding. The Enterprize is the focal point of the spectacular Melbourne Regatta, held annually during Melbourne Day week. Few class excursions are as exciting and engaging as setting sail on the Enterprize. Metro’s Dumb Ways to Die Opens in new window is a highly-acclaimed and award-winning "be safe around trains" awareness program. Metro also has experts who come to your school and community group to talk about safety, travel and trains. Book and get a Melbourne Day party pack for your students. Email Metro Trains for details. State Library of Victoria's early Melbourne and Victoria teaching and learning resources are supported by a range of activities. The inquiry units Opens in new window explore the historical significance of places, people and ideas in Victoria. They are based on the e5 Instructional Model Opens in new window and align with the Australian Curriculum and AusVELS. Who "founded" Melbourne? (PDF), part of The Making of Melbourne resource kit, was produced especially for schools by the City of Melbourne and Melbourne Day Committee. It includes a teachers' guide, student materials and activity sheets to bring to life the story of how Melbourne started. The exhibition features more than 1200 objects from Museum Victoria’s collection, making it the most complete and object-rich exhibition about Melbourne ever staged. Come nose to nose with legendary racehorse Phar Lap, ride in a restored Luna Park Big Dipper carriage, step into workers' houses from the 1890s and hear the sounds of Melbourne's music scene. See how where you live evolved from traditional Kulin lands to the suburbs of today. Learn more about how the city was founded and the early days, the gold rush, the 1880s boom, the 1956 Olympics, and more in this fabulous online tour. Free, fun Melbourne Day activities for teachers in classrooms, and parents at home, are available as downloads. See the Join in page. Aboriginal Australians the first people? Why is the Enterprize special? Was it Fawkner or John Batman? Was a baby one of the settlers? What happened to the waterfall? How did Melbourne gets its name? What is the Melbourne flag? Melbourne Day: Did you know?